Lighting with drones has come a long way. Just a year ago - from spring to fall 2016 - we were working on our first design of a powerful drone light. For our short, THE LIGHT and the release of the Freefly MoVI PRO, we used this first version of a drone light with great success. It had a decent output and nice soft quality with a 360 spread (incl. top and bottom). This was a great solution for what we needed but our design has evolved since then. After finishing THE LIGHT we discovered the work from Daniel Riley at Stratus LED, which had a very inspiring influence on us. His approach was to use a much harder light source - focused 100W LED COB chips that he'd hard mount under the ALTA 8. This was interesting and created beautiful results, though it had one major downfall: because the light was hard mounted, all drone movements would translate into the light. While flying this usually isn't a huge issue (it is less noticeable), in a stationary shot every little movement of the drone (compensation for wind) would result in a shift of the light beam and become very noticeable. The solution was an easy one: all of our future lights had to be mounted on a MoVI to create stable shots but also have full control over light movement, angle and directionality. 400W Spot light with 4x 100W LED chips and parabolic reflectors. This light uses a Connex Prosight HD FPV camera for remote framing and is also supported on a MoVI M15. MAXABEAM - HID Xenon light with a spot as narrow as 1 degree. Supported on MoVI M10. 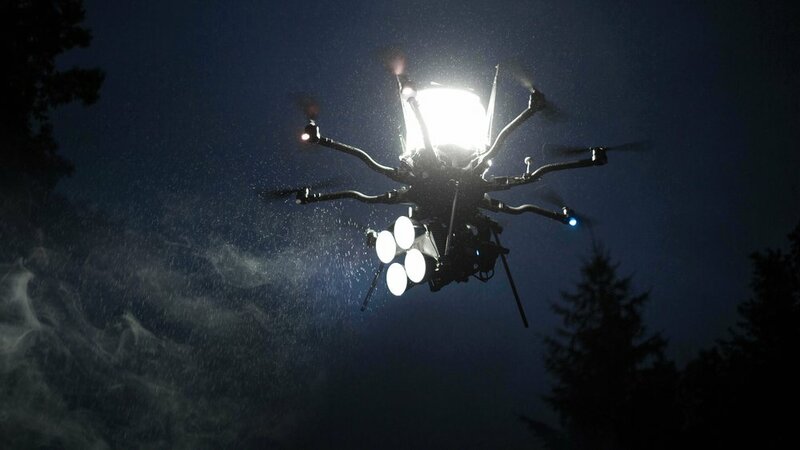 In the past we've seen drone lights being used for very stylized effects, like big, hard moving shadows at night. It is a very impressive look, but is also something that we've seen repeated a lot right now. The big question was: how could we use a drone light in a new way? How could it replace traditional film lighting - both in a very subtle way (that wouldn't immediately give away that it was lit by a drone) and in a creative way? All that being said: this is only a first test. We think this kind of lighting could be revolutionary for the film industry - pushing creative lighting in a completely new direction and open doors for indie filmmakers as well as high-budget feature films, commercials or even music videos. We are very excited to see where this technology is going and how we can use it on future projects! Big thanks to Adam Koontz, who was our pilot and a great collaborator on this one - and to Peter Paul Longo for the wonderful edit. As always - please feel free to reach out with any questions or ideas and we look forward to collaborating with you on your next project! All the best from the Brooklyn Aerials Team!